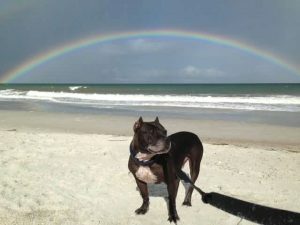 Today, Spartacus is an energetic, happy, and loveable Staffordshire Bull Terrier, but his life hasn’t always been easy. As a rescue, he was previously believed to have been used as a bait dog or sparring partner in dog fighting. When he was adopted four years ago by Dan Britt and Marcie Roberts, they even noticed that his incisor teeth were ground down so he couldn’t injure other dogs. Despite his scars, Spartacus’ sweet personality, and love for people made him a favorite at the shelter, and he is still recognized around town. “He is truly the apple of our eyes,” said Dan. Spartacus’ cancer diagnosis was purely by accident. In May 2017, Marcie and Dan took Spartacus to their primary care veterinarian for a round of shots as part of the routine boarding process before vacation. Even though he was a few months shy of his yearly checkup, Dr. Kimberly Carter offered to do a full physical. Dr. Carter found a heart arrhythmia and ordered an EKG and blood work. The blood work came back as normal, however the EKG showed premature ventricular contractions (irregular heartbeats) and a possible AV block. A few weeks later, an echocardiogram discovered a mass near his heart, which wasn’t detected on x-rays. A CT scan confirmed that Spartacus had cancer. With no previous symptoms, the preemptive checkup saved Spartacus’ life. Dr. Carter referred Spartacus to SEVO-Med, a partner of PetCure Oncology. At the time of Spartacus’ diagnosis, Dr. Carter was aware that SEVO-Med was about to install new equipment for stereotactic radiosurgery (SRS), an advanced form of radiation therapy. With SRS, high doses of radiation are delivered with submillimeter precision, requiring few sessions for pet owners and their pets. Marcie and Dan decided to move forward with SRS at SEVO-Med because the treatment was so short compared to other forms of radiation therapy that can last more than two weeks. “It really knocked my socks off that the total treatment was only three days,” said Dan. Spartacus getting some love from the staff at PetCure Oncology at SEVO-Med. Once PetCure Oncology at SEVO-Med officially opened, Spartacus received three fractions (treatment sessions) of radiation August 16-18, 2017. SEVO-Med is an hour’s drive from their home, so Marcie was able to take Spartacus home every day after his treatments. “The whole process was a piece of cake,” said Marcie. Spartacus was a bit fatigued after the first day of treatment, but the next morning he was running around at the beach. Marcie would tell fellow beachgoers he was undergoing radiation, and they were shocked to see the energetic and happy dog running around. The staff at SEVO-Med fell in love with Spartacus, giving him treats, spoiling him, and taking pictures with him. When he finished his last treatment, the staff put on his pet hero cape and a special graduation hat. Marcie was overwhelmed by their compassionate care and love for Spartacus. Marcie and Dan were extremely impressed by and thankful for the level of care at PetCure Oncology at SEVO-Med. “They are a true health care provider who definitely care,” said Marcie. Spartacus was the second patient to be treated at PetCure Oncology at SEVO-Med and the first graduate of their SRS treatment. 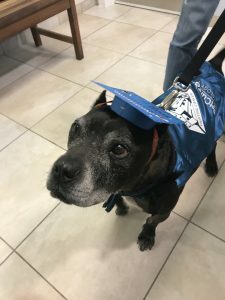 Spartacus in his Pet Hero cape and graduation hat after completing his SRS treatment. Two weeks after treatment, the tumor had shrunk by 40 percent. Spartacus continues to be his happy, vibrant, and his energetic self. He remains a local celebrity and even serves as a therapy dog at a local health care center. Marcie and Dan would recommend SRS to any pet parent. Learning that SRS was originally a treatment for cancer in human patients reassured Marcie and Dan that this was truly the best option for Spartacus. “Without a doubt, I would recommend SRS,” said Marcie. Dan says it is truly remarkable that the cancer was discovered, staged, and treated within three months. 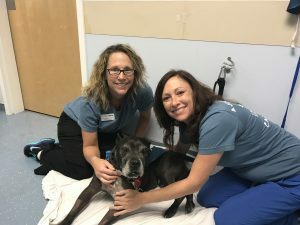 It all seemed to happen by chance, with an impromptu checkup that discovered a cancerous tumor and then the opening of a nearby PetCure Oncology location.